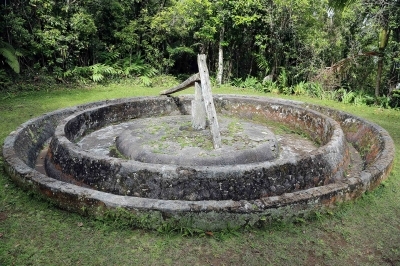 The Archaeological Landscape of the First Coffee Plantations in the Southeast of Cuba forms a unique testimony of agricultural exploitation for coffee production. The plantations are located in the mountain valleys of the Sierra Maestra. The designated zone contains the remains of 171 historic coffee plantations. They were established in the 19th and early 20th century, by French colonial plantation owners who had fled Haiti after independence. Listening to recommendations I picked La Isabela for this. It had at least a road going to the point of the museum on the map. From Santiago it takes around 30 minutes up a steep mountain by car. The first thing you will see is an observatory which requires a hike going up. I doubt anyone goes up here but there was a busload of people having lunch at the cafeteria. This place has nothing to do with the coffee plantations, which I find a great shame because the road continuing on becomes impassable without a 4WD or risk of getting stuck with your crappy Kia. The road to the coffee plantation is another 2km and I drove it for another 1km before giving up on the road, and I'm glad I did. In fact I think I wasn't supposed to drive in here at all and walk all the way from the cafeteria but anyway the last 1km is doable on foot with amazing views of the surrounding lands. There are even some local restaurants which I doubt anyone ever visits. When you reach the marker on the map there is a sign pointing up the the coffee plantation museum including a UNESCO sign. A few steps higher and you can see the house peeking through the treeline. After arriving you are greeted by a Spanish-speaking museum guide to pay an entrance fee, including paying for taking pictures. There was of course no ticket or whatever but it was maybe $5 in total. I asked if they get tourists up here and he said very few, plus gave a brief history of the plantation while pointing out some photographs. You can visit the workshops and the kitchen plus upstairs for the living quarters. There was a big viper inside of the rooms sleeping but the guide told me not worry... he did give me a gardenia from the lovely gardens and I was happy to be on my way again. They actually have a gardener taking care of the grounds which surprised me even more. I think it's great that a place is taken care off with the funding they get from the state. Lastly I recommend going to the coffee drying areas for a good picture of the plantation house from the front. Visited La Isabelica in May 2018. This coffee plantation (cafetal) is the only easily accessible and preserved site of this group. While inscription dossier tells about 171 plantations, we haven’t identified en route any indications or directions for other sites. As we understood they're completely ruined and accessible only with unmarked hiking trails. 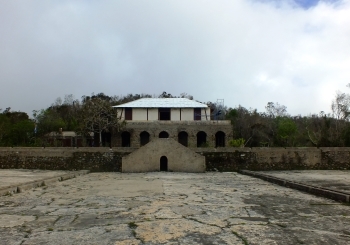 So, this most famous cafetal La Isabelica (constructed in the second half of 19th century by a Frenchman migrated from Haiti) provides best synthesis of this serial site. There is 2-km walking hike from La Gran Piedra (huge rock formation on top of the mountain) with some stunning views up to the sea. The entrance fee is 2 CUCs and the guy provided overview of the house and surrounding coffee constructions plus described briefly the whole process of coffee cultivation. On the ground floor, there is also exhibition of various torture instruments for the slaves. 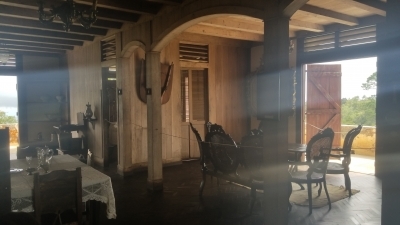 The French owner (who married slave woman) lived on the first flow and there is carefully reconstructed interior. The most impressive external constructions are secadero (drying surface in front of the cafetal) and grinding mill for the primary processing of the beans (on the foto). Position on the slope of the mountains of Sierra Maestra (La Isabelica is located somewhere 1100 meters over sea level) provided best humid and cool climate for the coffee growth. Interesting site providing insight on history of probably the most used beverage in the world (or tea is number one?). However, for the future would be good to have a couple of other cafetals restored. We also purchased locally grown coffee for 10 CUCs, but not tried it yet, so can't provide recommendation. This site lies within a taxi ride of Santiago, Cuba's second city. When I visited, on a pleasant, sunny day in February 2001, the site had only been inscribed for a few months, and perhaps that was the reason I found it almost impossible to get information about it. UNESCO tells us that the site is in 7 parts. I don't know if any (or all) are contiguous nor how many of these parts I have actually set foot in. On my visit, because of the condition of the road the taxi driver would go no further than La Gran Piedra, a huge perched rock at an altitude of about 1200m. After that I continued walking uphill for maybe 3kms until I came to La Isabelica. Here the house and plantation of a former coffee grower have been turned into a museum. The house, once owned by a French planter who, along with a number of his compatriots, moved to Cuba when life in Haiti became difficult, is not lavish but is attractive and has been well restored and furnished. Access to the first floor living areas is only by way of a narrow bridge over the deep trench dug to surround the house. It was not clear to me where the plantation labourers (were they still slaves at that time?) lived. Perhaps their (presumably less substantial) dwellings have since been reclaimed by the forest. The ground floor of the building seemed to be occupied solely by utility rooms and a lot of tool storage space. Adjoining the house was the secadero, the large hard- surfaced flat area on which the beans were laid out to dry. I understand that, to provide shade, the coffee was inter-planted, often with citrus and other fruit trees and although the steep hill slopes down from the house have been largely reclaimed by the forests it is still possible to see remains of this practice.Is this the Cultural Landscape to which UNESCO refers? I would like to have learned more of this aspect of Cuba's history (perhaps, in the last few years better, fuller site interpretation has been provided) but at least I left with a souvenir,which I still have, a now dried out twig from a coffee bush complete with beans and leaves.